Hi!Â It’s me, Elizabeth, posting for Mama ’cause I am Mostest Nice. 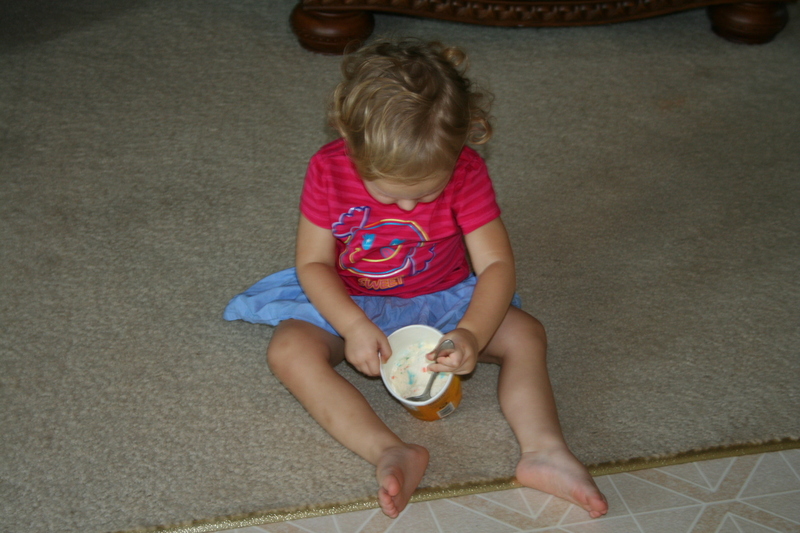 Let me tell you a story.Â Once upon a time, I was sitting on the big chair with Dada.Â We were having some ice creams.Â Then Dada said “okay, Elizabeth, we are all done.Â Please carry this to Mama in the kitchen.”Â Then Dada handed me the ice creams and the spoon! I walk halfway to Mama.Â Then I have much better idea! I will eat the rest of these ice creams myself!Â That is less work for Mama to do. She won’t have to put the ice creams back in the freezer.Â And she won’t have to wash the spoon. I am Mostest Nice and Helpful baby.